In designing its "Extrema" series of defensive ammunition, Fiocchi selected the tried and true Hornady XTP jacketed hollow point bullet. 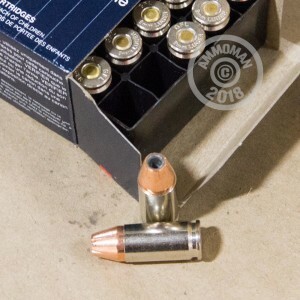 The 124 grain XTP bullets found in this 9mm Luger load deliver an excellent balance of penetration and expansion and are designed to quickly incapacitate assailants. 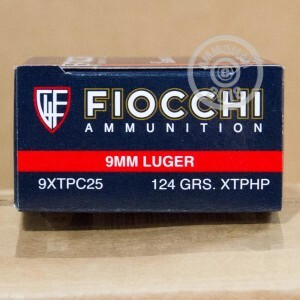 Fiocchi ammunition is well-regarded for its low cost and good quality. Most Fiocchi ammo sold in the US is manufactured at the company's American production facility in Ozark, Missouri, with some (primarily rimfire) being imported from Italy. If you're serious about self-defense and want to shoot what you carry, this 500 round case is the perfect choice. In addition to getting a great volume price, you'll instantly qualify for free S&H at AmmoMan.com, where all orders over $99 get delivered at no extra charge! I bought this to hold onto and am very satisfied with the rapid delivery. The company was recommended by to me from a friend and I will do the same. I got these rounds to store for a time when I might need them in a defensive situation to use in my Hipoint carbine. 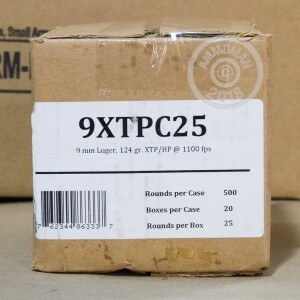 I think 124 gr bullets are the best weight in 9 mm and the XTP is a great defense round. The Hipoint spits these Fiocchi's right out as smooth as a round nose. Great ammo at a great price from a great supplier, that's AMMOMAN. great stuff, arrived very quickly. From N.J. to Texas in a flash. All ammo looks good.